Another post for me that is simple and hopefully serves as an example for people trying to get blogging as #SQLNewBloggers. This is also a part of a basic series on git and how to use it. One of the things I had to show recently was a restore to a point in time, and I needed to actually lookup syntax. That’s a good excuse for a #SQLNewBlogger post, so here we go. Relatively few of us use marked transactions, but they can be useful. However, this post looks at time. Let’s do a few things and show how this works. The first thing I need to do is get a database, with some data. I’ll create a database, add a table with a row, and then back up the database. Next we want to add some data to the table and get some log records. In this case, I’ll use a simple loop to add a new row to the table every second. This gives me some points in time to look for and use to show I am restoring to a point in time. My log backup contains all these records. If I restore the full backup and log now, by default I’ll end up in this state, with all these rows in my table. However, what if I want to only get the first 5? 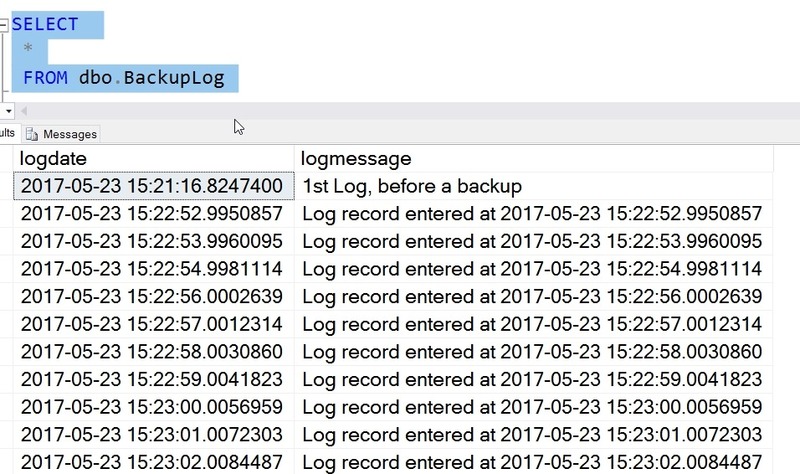 Only the log activity before this time is restored. After I’d looked up the syntax, I spent only about 10 minutes setting up the demo and getting this ready. Practice skills and write about it. Show your next employer you are always learning and working. This entry was posted in Blog and tagged administration, Backup/Recovery, sql server, SQLNewBlogger, syndicated. Bookmark the permalink.